No, I’m not crazy. Well, maybe a little. Yes, I turned my oven up to 450. In the summer. But it was sorta cool out. We’d been at the pool, and kicked out by a massive thunderstorm that was followed by a cold front. And the temps dipped to a chilly 78. Yes, that feels chilly at this point. So I took advantage of this cool afternoon to make these flautas. They are one of my Try 13 Challenge recipes, and I’m so glad that we tried them! Two (maybe 3?) of my four children (jury is still out on the baby!) have a dairy allergy – asthma & eczema, boo! – so we don’t eat much cheese, and I make my own white cream sauces using rice milk. I do occasionally purchase shredded non-dairy cheese and use it quite sparingly. This recipe is perfect, as it uses less than 1 cup of cheese…so I can stretch their expensive cheese as far as possible. 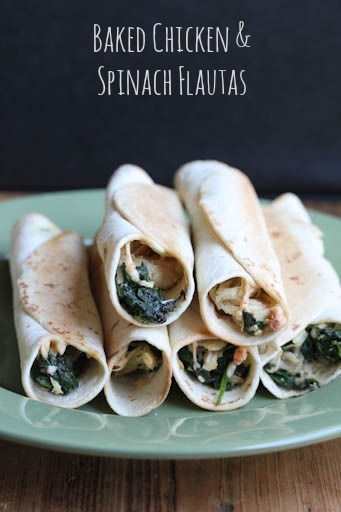 While I was preparing this, it reminded me of these delicious Chicken & Spinach Enchiladas. Except without all the cheese and sauce on top. Super simple prep – mix together cooked chicken and spinach with some cheese. Roll in tortilla. Brush or spray with oil. Bake in hot, hot oven. Turn. Bake. Serve. Also, I love having cooked and shredded chicken in the freezer, in 2 cup portions…for meals just like this one. On the dinner in less than 30 minutes, if you’ve got the chicken pre-cooked! Hope y’all enjoy these flautas!!! Set out spinach to thaw. Once thawed, drain well. In a mixing bowl, stir together the chicken, spinach and cheese. Spoon into the tortillas. Roll the tortillas and place seam side down on greased cookie sheet. Spray or brush with oil. Bake in the pre-heated oven for 10 minutes, then flip and bake for another 5 to 10 minutes. Serve Baked Chicken & Spinach Flautas with side of corn or other favorite tex-mex food. I have issues with gluten, but these look fabulous. Do you think corn tortillas would work as a substitute?